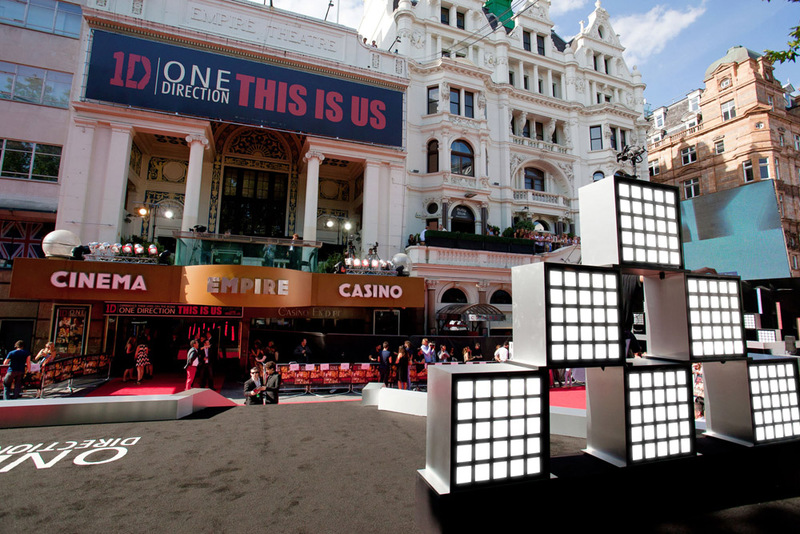 With an estimated 70,000 fans screaming and hoping to catch a glimpse of One Direction, the five-member band walked the red carpet outside the Empire Cinema in London’s Leicester Square for the world premier of “1D: This Is Us.” Lighting design and production was handled by premiere veterans Limited Edition Events who utilized RUSH Series Strobe 5x5’s to add some eye-candy to the daylight event. Emitting an intense but diffused cool light the units produced a myriad of pixel mapped effects which looked fabulous on the global live broadcast. Nearly 30 RUSH Strobe 5x5’s, provided by HSL lighting of Blackburn, were built into two double sided pyramid set pieces on the main stage along with two smaller pyramids on the DJ stage. With strategic spacing between units an exploded video effect was created. Each of the hundreds of pixels – 25 in each strobe – were controlled individually through the new M6 lighting console. The M6 is a state-of-the-art lighting console, which functions as an advanced ‘visual control’ surface, able to control any lighting rig from conventional moving lights to digital fixtures and LED pixels. Controllable via multiple DMX options or sound activated, RUSH Strobe 5x5 includes preprogrammed effect, letter and number macros for easy-to-produce graphics and messaging. RUSH provided a stellar performance on camera and for the live audience, receiving a vast amount of positive comments from both technicians and the end client.